Fundamentals II rapidly reviews Fundamentals I in the first eight lessons. The charts that the student should be familiar with from Fundamentals I are presented and the student is given lots of review exercises. Fundamentals II focuses on analyzing and understanding some of the more complex ideas in Latin. The student learns the four principle parts of the verb and the perfect system verb conjugations in Latin. The course moves to using the more traditional names for the Latin tenses — present, imperfect, future, perfect, pluperfect, and future perfect. Personal and reflexive pronouns, adjectives, first and second conjugation, and complex uses of the dative and ablative are taught. The book ends with six "additional topic" lessons. These are extra lessons for students with the time and energy. The material covered in these lessons is material that is not necessary for the student to master at this level, but will come up in future Latin courses. These lessons cover relative pronouns, special adjectives and verbs that take the dative, intensive pronouns and adjectives, participles, and some Roman culture. 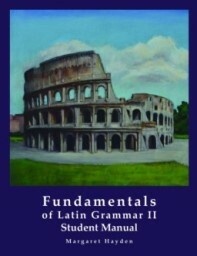 Fundamentals II prepares the student well for a challenging high school level Latin course. The amount of work is significantly increased from Fundamentals I. Every lesson includes vocabulary drills, form drills, analytic exercises, and lots of translations. Students who complete Fundamentals II are more than prepared to begin Henle Latin. In fact, they usually fly through Latin I (first half of the purple book) and are ready to move directly to Latin III (skipping Latin II). They do exceptionally well in MODG's Advanced Latin program. Strong students have also gone straight from Fundamentals I to Henle Latin I, where they have done well, although they often need a little extra help in making the transition to a text that begins in a more traditional style with first and second declensions and conjugations. For more information, please see books.modg.org: Fundamentals of Latin Grammar 2.